Julia Kristeva, born on June 24, 1941 in Bulgaria, is a structuralist philosopher, sociologist, psychoanalyst and literary critic famous for her semiotic theories. She left for France at the age of 23 and has lived there ever since. She is also an ardent feminist and a novelist. Influenced by Roland Barthes and Lucian Goldmann, she pursued her original interests in the field of linguistics. She extensively studied both the Freudian and Lacanian methods of psychoanalysis, and contributed to the world as both an academician and analyst. She remained one of the first structuralist at a time when structuralism was making its way in the field of Humanities. Her works also consists of original post-structuralist ideas. Her many books and essays present ideas on a wide range of subjects, ranging from art and art history, to semiotics in the field of linguistics and literary theory, political and social commentary and psychoanalysis. 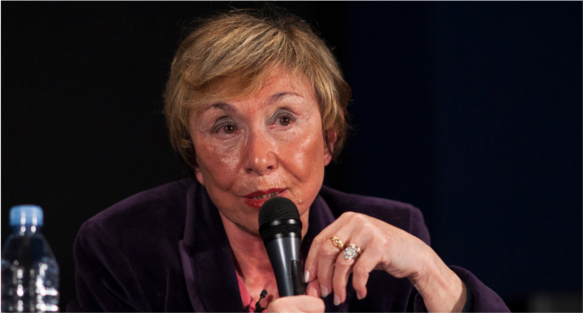 Kristeva’s writings can be distinguished by two main trends; early on she was under the influence of a semiotic-structuralist set of ideas and later entered a feminist-psychoanalyst phase. Her theories have been extracted from thinkers as diverse as Jacques Lacan, Michael Foucalt and Mikhail Bakhtin. During her second phase of thought, she presented a new concept which she named ‘semianalysis’; a combination of the study of signs (semiotics) and psychoanalysis methods of Sigmund Freud. She also marked a clear distinction between semiotics and the symbolics of a language, which is perhaps her most important contribution to the field of linguistics and philosophy of language. Semiotics is associated with the maternal body, and corresponds to the tone and rhythm, whereas symbolic is what we may term as the syntax and rules of grammar of a language. In 1982, through the publication of Powers of Horror, she explained the pre-mirror developmental stage of a child’s entry into Jacques Lacan’s Law of father and the experience of maternal rejection. She maintains the judgment of oscillation of the semiotic and the symbolic identity in her later works, such as in the Revolution in Poetic Language. In the late 80s she produced some of her works based on narcissism, like the Tales of Love and Black Sun, which contained excerpts from her practice as an analyst earlier. In 1989 and 1990, Strangers to Ourselves and Lettre ouverte ý Harlem Désir were published respectively. These works focus primarily on difference and diversity within identity. Kristeva compared the two social sciences of anthropology and psychology, and concluded that they connect the social with the subject. The two fields are not each others’ representatives; rather they serve to save the group and the subject. In her distinction between the two fields, she also reflected that our societies are also constructed in the same way in which a person abandons the seemingly worthless mother in search of his identity. By this she means that our cultures are losing its feminine and maternal traits to emerge into a being. She is also held in high regard as a key French feminist, and her name is taken with the likes of Simone de Beauvoir and Luce Irigaray, She has impacted the feminist movements worldwide, specifically in the UK and the US. The French government, in recognition of Julia Kristeva’s philosophical and literary contributions to their culture awarded her with the Order of Arts and Letters in 1990.